In the spirit of Thanksgiving (coming up on Thursday) I borrowed some books from the library about thankfulness and the many blessings we have, rather than specifically about the holiday of Thanksgiving. I think these are great choices for children to share the spirit of Thanksgiving. Of course if you prefer a fun craft book to use with kids for Thanksgiving click here and you can click here for children’s books specifically written about Thanksgiving. 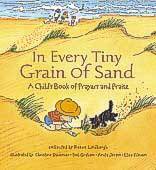 In Every Tiny Grain of Sand: A Child’s Book of Prayers and Praise is a picture book in that it is divided into four sections, each with a different illustrator, and uses the writings of many writers not often associated with children’s books. The selections in the book are from a variety of authors, cultures, and religions. These encompass Christian, Jewish, Hindu, Native American, Muslim, Baha’i, Algerian, Buddhist, Celtic, African-American, and East African, among others. The authors and sources range from the anonymous to the well known. They include the Bible, Robert Browning, Christina Rossetti, Walt Whitman, Pope Pius XII, Anne Frank, Margaret Walker, Black Elk, and Albert Schweitzer. One of the greatest assets of this book is the quality of the writing. Children are not often introduced to writing of this caliber, in a way that has meaning for them, at an early age, and this book provides such an opportunity. In Every Tiny Grain of Sand: A Child’s Book of Prayers and Praise is a 10-inch by 11-inch hardbound book with a colorful dust jacket and different colorful illustrations on its cover. The book’s four sections are “For the Day,” “For the Home,” “For the Earth,” and “For the Night.” “For the Day,” was illustrated by Bob Graham. His watercolor and ink illustrations provide scenes of children in all seasons and many different places enjoying their activities, creating an effective accompaniment to the prayers and poems of thanks in this section. The delightfully detailed watercolor and collage artwork of Elisa Kleven reinforces the joys of home, family, and nature that are celebrated in “For the Home.” “For the Earth,” broadens the celebration of nature with lively watercolors by Christine Davenier. Here the emphasis is on both being thankful for the earth, animals, and seasons, and on taking care of the earth. Anita Jeram is a master at painting night scenes that are both dark and vibrant with color and life. Her dense acrylic illustrations in “For the Night” cover every page and incorporate the poems and writings into the artwork. Jeram’s artwork embodies both the mysteries and the beauty of the night, a fitting finale for In Every Tiny Grain of Sand. This is not a book meant to be read at one sitting. Instead, it is a collection to be dipped into, enjoyed, and discussed again and again. In her introduction to the book, Reeve Lindbergh describes the collection, stating, “Some of them were written in appreciation of nature, or to praise God, or to celebrate good things in our lives like our families, our homes, and our love for one another. Others were written when the writer needed strength, comfort, or courage.” I hope you will enjoy the book as much as I have. The Book of Giving: Poems of Thanks, Praise and Celebration By Kay ChoraoThis is a collection of 61 poems of praise, thanks, celebration, and sharing, ranging from an excerpt from the Bible’s “Book of Solomon” to a Native American prayer. Langston Hughes, James Weldon Johnson, Robert Louis Stevenson, William Blake, William Butler Yeats, and many contemporary poets are included, along with lesser-known writers. There are several selections celebrating Thanksgiving, Hanukkah, Christmas, Valentine’s Day, and birthdays, as well as the seasons and the Earth. Different cultures are represented by an Irish folk blessing, an Algerian prayer, and several Chinese poems, adding to the book’s universal appeal. Soft, finely detailed illustrations in pastel colors enhance the warm, joyous spirit of the collection. This book is intended for ages one- to six-years old. The colorful illustrations and simple text make this story perfect for toddlers. Every facet of God’s world provides a reason for a child to be thankful: from the glorious sunset to the beauty of the seashore, trees, and flowers. I picked out this book at the library simply because it looks so cute. It’s in the shape of a basket, colorful and sparkly, and fun to touch for a young child. With the topic of thankfulness it’s perfect for Thanksgiving. The author, Dr. Mary Manz Simon has embodied thought leadership in the Christian market for more than 20-years and this book shares the reasons to thank God for our many blessings. The publisher recommend the book for children three-years old to but I chose it for a toddler and she loves it.